Can I demo trigger before paying? Yes - we encourage you to sign up for a free 30 day trial account as we're confident you will love Trigger as much as we do. You can sign up for a free 30 day trial account here . If you decide to upgrade to a paid account, your trial account will become your paid account and you will keep all of your existing data so you can seamlessly continue using Trigger. Do I have to pay for my clients to access trigger? No. You only pay for employees within your company. Clients can view and comment on public projects and tasks of your choosing. You can invite an unlimited number of clients to collaborate. Can I give employees different permissions within trigger? Yes. There are 4 levels of permissions. "Employee", "Contractor", Admin", and "Owner". Each one will let the assigned user see and do different things. The employee invitation page has all the details, so you can decide which level is appropriate for a new user before inviting them. No. As Trigger is a subscription based service with no long term contracts, you simply pay a monthly subscription fee. 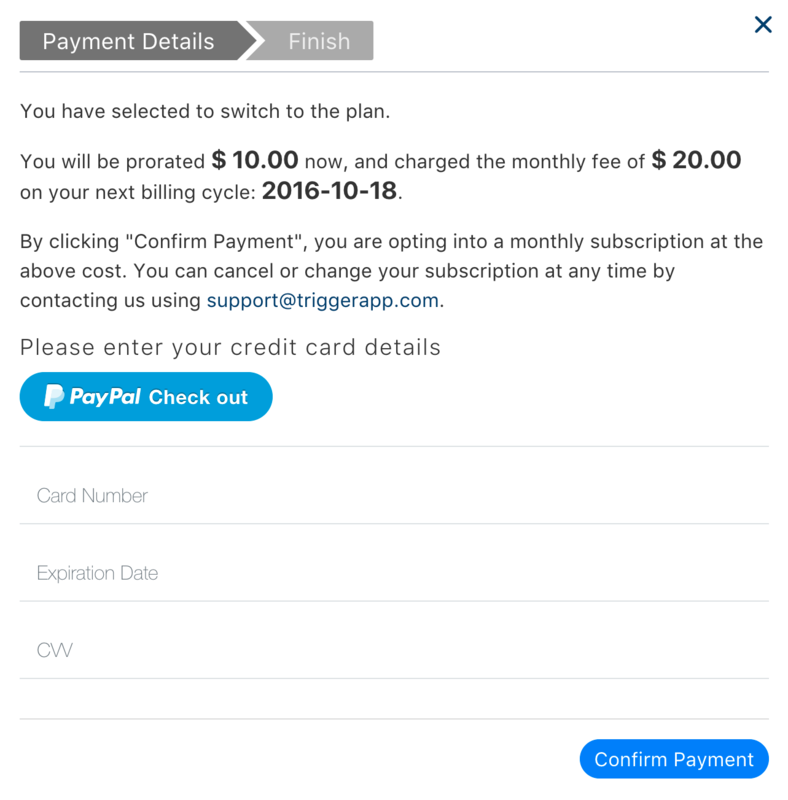 You can cancel your subscription at any time and that will be the last month you pay for. Once your trial is up, you can log in, and access the subscription screen directly, where you can decide who needs access. The cost of the subscription will be clearly visible, along with when your billing cycle begins. Type in your details, and click confirm. You will then have uninterrupted access to Trigger. Your subscription will renew automatically. Every Trigger account is housed in the cloud with the world class Amazon Web Services data center. With high-end physical security, firewalls and 2048 bit SSL encryption just like your Internet banking, only you can access your data with your password. The Amazon cloud servers come with built-in backup and failover and redundancy so you can rest easy. What are the system requirements to use trigger? Trigger is a cloud-based service so all you require is an internet connection. There is nothing to download or install and you can access your Trigger account from anywhere in the world using a computer, tablet, or web capable mobile.